Hi! It's gorgeous outside!! I'm in love with the weather right now, it's beauuuutiful! So here's a springy mani for you, inspired by the amazing layering idea of Steffels. Seriously, this girl has the most PERFECT nails and pictures and layering ever ever ever. Blogger crush.. 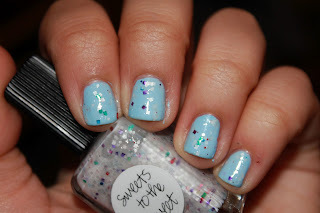 Anyway, I wanted to put Lynnderella's Sweets to the Sweet over a light blue, and I'd had Love & Beauty's Sky Blue out already from the All that Glitters layering, so there's 2 coats of SB and 1 coat of SttS, though I think I'll put 2 coats next time.. Or a thicker 1 coat. We'll see haha. Adorable combo! I agree, it's so perfect for spring and looks so light and airy. I am loving this perfect for spring time! 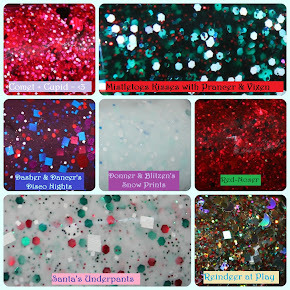 ugh lynnderella just looks so amazing i can't wait till the day i get my hands on some of these!! thank you! i hope you can soon!